To arrange complimentary shuttle pick up please call the hotel after collecting your luggage at the airport. This Property is 100 Pct. Non-Smoking The Hampton Inn Las Vegas - Tropicana hotel is located on Dean Martin Drive just a quarter mile from Nevada*s world-famous Las Vegas Strip. Hotel guests are less than a mile away from I-15 Mandalay Bay Convention Center MGM Grand Conference Center and an endless variety of restaurants shopping and entertainment. The Fashion Show Mall Las Vegas Premium Outlet and the World Furniture Market are all within five miles of the hotel. 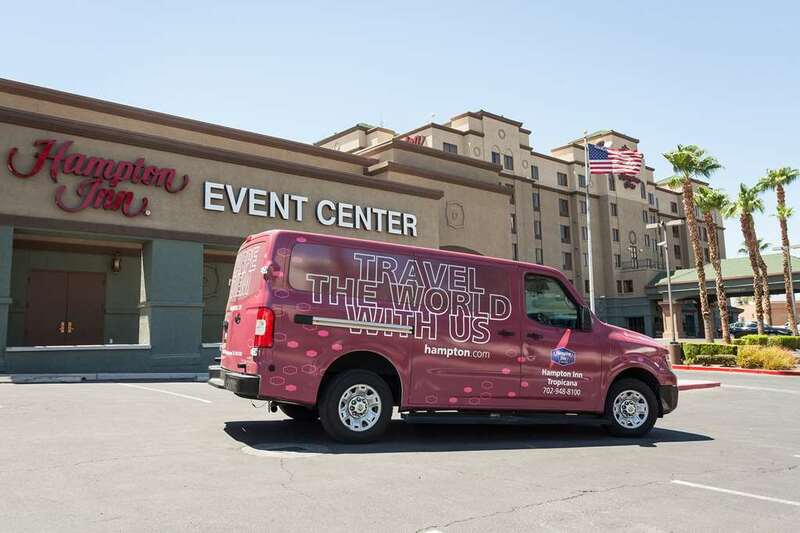 Our Las Vegas -Tropicana Hampton Inn is only 1.5 miles from the McCarran International Airport and it is our pleasure to provide complimentary roundtrip airport shuttle service and complimentary drop-off shuttle service to The Tropicana Casino from 5am - 1am. Sure to please the busy executive or leisure Nevada traveler Las Vegas Hampton Inn hotel guests enjoy a free hot breakfast daily served buffet style and a host of convenient amenities on the property and in the guest rooms. Whether traveling on business or pleasure to Nevada our Las Vegas Hampton Inn hotel has the service amenities and location to meet your needs. Your stay is backed by our 100 Hampton Guarantee. If you*re not 100 satisfied we don*t expect you to pay. That*s our promise and your guarantee. We love having you here in Nevada at the Hampton Inn Las Vegas-Tropicana hotel. Skinny Fats: Bright casual stop for variations on basic eats including burgers salads - fresh juices. McMullan*s Irish Pub: The McMullan family welcomes you - yours to their little slice of Irish heaven that the Las Vegas Weekly calls *The Best Irish Restaurant in The West. * If you fancy a taste of the ultimate authentic Irish Pub experience come on by. Enjoy Excellent Food Perfect Pints Live Music Fun and Gaming. Brio Tuscan Grille: Warm relaxed Italian eatery serving Tuscan-inspired grill fare wine - cocktails. Located at Town Square Mall. In-N-Out Burger: Classic California-based burger chain serving customizable patties hand-cut fries - thick shakes.